- Broken antenna, black gill, tail rot, or black spots occur. - Shrimp is dirty and weak; has dirty gill; the body converts into red pink; stop eating and die. 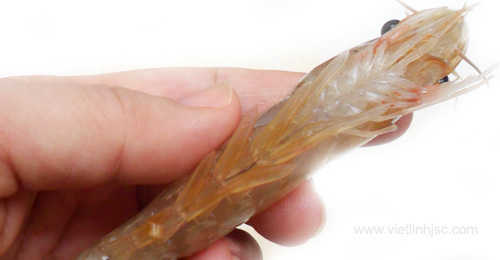 - Shrimp deaths can occur when the diseases are in acute phases. If it happens chronically, shrimp can grow slowly, have soft shell and separate with their groups. - The main agents causing the diseases are bacteria of the genus Vibrio. - Vibrio bacteria enter farming ponds by water, breed, and feed from the bottoms if cleaning work is not effective enough. + Keep good water quality in ponds. + Shrimp density is not too high. + Avoid vulnerable factors to shrimp. + Recurring use of microbial products to reduce the amount of organic matters in ponds. + Reducing salinity down to 15-20 per thousand may restrict the development of Vibrio bacteria. + Increase resistance with good environmental management and vitamins C, A, E.
+ Improve environmental conditions and kill bacteria in shrimp body: siphon bottoms of the ponds; change new water to reduce density of bacteria in water; use products permitted in the list of the Ministry of Agriculture and Rural Development and base on the manufacturers' instructions. + Increase resistance for shrimp with vitamin C in feed. + Use squid oil combined with feed: 5-10ml/kg of feed. + Stimulate molting by Saponine 10-15g/m3. Viet Linh © 2015. Translated by Sonia Linh V.